Also notice that the indicated layout for Belgian is wrong. 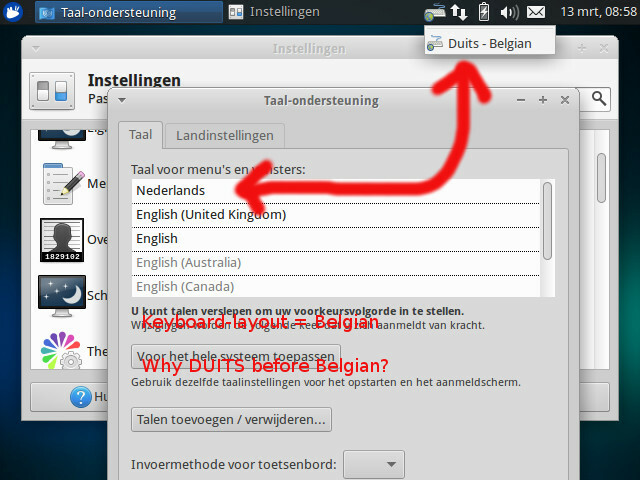 The name "Duits-Belgian" is shown, which make no sense. It affects an essential hardware component (disk controller, built-in networking, video card, keyboard, mouse). William, can you have a look? From the screenshot, it looks like that dialog is for setting the display language, not the keyboard layout. Also, the indicator is the IBus one, and since the display language is set to Dutch, it translates the "German - Belgian" keyboard layout as "Duits - Belgian". So I don't think this is a bug tbh.